Director/Writer: Greg Huson / Writer: Craig Carlson / Cast: Scott Weinger, Juleah Weikel, Lindsey McKeon, Billy O’, Brad Hawkins, Holly Towne, Peter Riggs, Candace Moon, Ron Varela, Seth Reston. 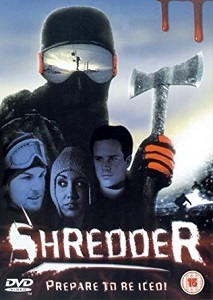 Likeable characters and a scrappy production approach elevate this Idaho-lensed ancestor of Iced over and above most straight-to-video efforts, which throws a group of snowboarding college kids into a condemned ski resort where a mystery-loon in skis has it in for them. Friend-zoned nice guy Cole thinks he and rich Daddy’s girl Kimberly are going alone to Rocky Summit, but she has invited her cousin and some friends (who say ‘dude’ and ‘whatever’ a lot), and intends on meeting her real object of lust there. Alas, he boarded into a wire trap and lost his head during the credits. The locals are quick to warn the outsiders of the ‘restless spirits’ that curse the mountain, and there’s a relevant backstory of a young girl who skied a tree after being chased by a trio of drunk snowboarders some years earlier. The teens play drinking games, flirt, bribe the horny local sheriff into letting them stay, and get picked off one by one by the rule-stickler skier, who axes them, hangs them, and impales-via-icicle. 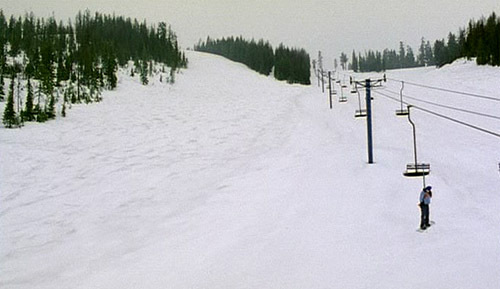 The film makes the most of its chilly seclusion, with characters huddled in the lodge with only lanterns and sleeping bags; bodies are found in snow-angel formations; a camcorder ejects a tsunami of blood, and there’s a good chase scene, where a severed head becomes stuck on the end of a ski-pole. Shredder also elects a final boy for its third act, shaking things up a bit. The identity of the killer is fairly obvious and, once revealed, means the character was able to teleport around the locus like lightning. But this is a teen slasher film, rarely will you find one that stands up to logistic scrutiny. The lean 83 minute runtime has excised all the chaff so it’s certainly not boring and also rocks a pretty fun soundtrack, although some early-CG FX work leaves a lot to be desired. IMDb lists the film was being released in 2003, but I remember picking it up in Blockbuster in 2001, when I was looking to rent The Pool. Don’t go in expecting another Cold Prey and you should have a good time with this. Blurb-of-interest: The adorable Billy O’ was previously in Lovers Lane.